The Galactica comes across a colonizable, but seemingly uninhabited world. When the fleet is forced to come to a stop to effect repairs on a ship of the fleet, the Galactica detects an ideal habitable planet in a nearby solar system. Investigating, the Galactica is stopped by the sudden appearance of an immense alien ship in a parking orbit above the planet. When the ship refuses to communicate, the Galactica sends a research shuttle down to the planet's surface, escorted by Apollo. The planet is a virtual paradise, uninhabited. But, while investigating on his own, Apollo encounters a beautiful woman called Sarany, whom no one else can see or hear. Then she vanishes, even from Apollo's view. Later, on the Galactica, Apollo sees her again and she begs him to fly back down to the planet for answers. Apollo takes her back down in his Viper, but then the Viper and its occupants vanish. This leads the Council of Twelve to declare a virtual state of war between the fleet and the alien ship, forcing Adama's hand into launching a pair of Vipers, Starbuck and Boomer, to attack the vessel. Meanwhile, Apollo learns from Sarany that her people of the planet, Thar, have mastered many technologies, including time manipulation, leading the fleet to view only the planet's primitive past and not the current civilization that has thrived there in peace for centuries. The immense alien ship in orbit is actually just a mirage projected by the Tharnians, but the attack against the ship by the Colonials leads them to reject the fleet to making a new home there. A seeming attraction between Apollo and Sarany is left unfulfilled, as the fleet is forced to move on in its search for a home. I've chosen to place this story during the break between Realm Press' published issues of the so-called seasons two and three of BSG and before "Time Bomb". Commander Adama remarks that he wonders how they've kept this "circus outfit" of space taxis, freighters, and pleasure craft together, implying it has been some time. In addition, the Galactica crew seems surprised to discover a new planet and also does not seem to be wary of allowing the battlestar to leave the fleet to investigate, so they seem to think the Cylons are not close by, suggesting it takes place before the Cylons put in another appearance in "Time Bomb". This story appeared in thirteen issues of Look-In, a UK magazine geared towards kids. The story is told in comic strip form and appeared in two-page chapters of each issue. The story itself is untitled. I borrowed the title "Beautiful Mirage" from the Battlestar Galactica Chronology on the Look-In wiki (this site was also the source of the writer and artist credit on the story since there are no credits on the story itself). The characters use a lot of Earth English slang and terms in this story, such as "tarnation", "jim-dandy", "fellers", roast duck, and others. It always kind of pulls me out of the story when science-fiction characters use modern Western slang they shouldn't know about. As in "Time Bomb", it seems that ships of the fleet have been designated with numbers to help the Galactica keep track of its flock. On page 1, panel 2 of the story, Commander Adama appears to be wearing a brown Warrior's jacket and Colonel Tigh a brown Warrior's uniform! 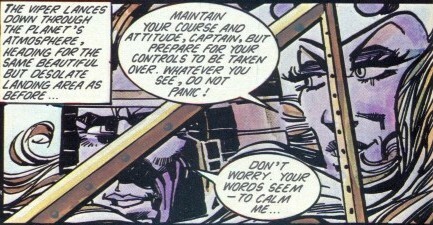 And in panel 4, Starbuck appears to be wearing a purple shirt under his Warrior's jacket! Ship Number Three goes off course, reporting its gyrotron is malfunctioning. In the real world, a gyrotron is a type of high-powered vacuum tube that generates electromagnetic waves used for high-tech heating needs. It seems unlikely a gyrotron would have anything to do with a spaceship maintaining course. On page 1 of the story, Apollo remarks during Starbuck's card game that he's amazed that Starbuck doesn't look like a playing card and Starbuck retorts, "I'd have to be an Ace." Of course, the Ace is a playing card in common Earth decks...I guess the Colonials use the same types of cards in some games! 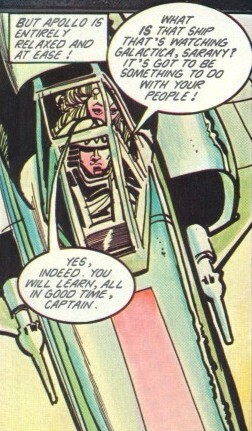 Starbuck's comeback may also be a reference to being a flying ace. Apollo and Boomer play a game of statch, described as a free-fall (anti-gravity) version of squash. On page 2, panel 2 of the story, Apollo remarks that his call to report to the commander is probably to post him to ship Number Three as relief skipper. But the narrative box in panel 3 then incorrectly attributes the remark to Boomer. Athena states the newly detected planet is at range 30-30 on the Kalnak scale. This is the first use of the Kalnak term in the BSG universe and appears to be a fictional scale. In this story, the fleet, even Commander Adama, seems interested in finding any suitable planet as a new home rather than searching for Earth specifically. Colonel Tigh suggests leaving two squadrons of Vipers to ride herd on the fleet while the Galactica investigates the planet. But then only six Vipers are left behind with the fleet...three Vipers is an awfully small "squadron"! It seems like Tigh meant two flights of Vipers, a flight usually comprising 3-6 aircraft. In the TV series it was never made clear how many Vipers make up a squadron, such as Blue Squadron. Whatever he meant, a measly 6 Vipers seems pretty low to guard the entire fleet with the battlestar away. On page 5 of the story, Adama is seen talking into a hand microphone on the bridge to Blue Squadron. But a hand microphone was not seen used on the bridge in episodes of the TV series. Adama would use such a device in his quarters when dictating into his journal. Also on page 5, Starbuck remarks on being a sitting duck in front of the gigantic alien spaceship orbiting the planet and suggests serving himself up roast, with orange sauce. Roast duck with orange sauce is a popular Earth dish in the Western world; seems unlikely the Colonials would know of it. 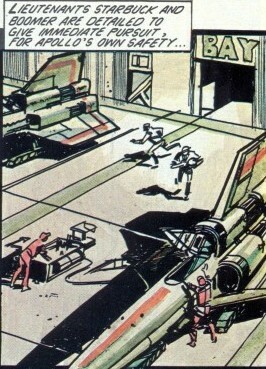 On page 13, panel 3 of the story, the word "Bay" is seen in large letters over one of the entrances to the Galactica's launch bay. Apollo flies Sarany down from the Galactica to the planet in his Viper. Very close quarters! A couple of times in this story, Boomer refers to Starbuck as Buck. Boomer has also been known to refer to him by the nickname Bucko (in "The Nightmare Machine" and the novelization of "The Gun on Ice Planet Zero"). The native inhabitants of Thar looked human. Were they? How did they get there? They seem to speak the same language as Captain Apollo...or were translator devices used? Were they related in any way to descendants of Kobol?